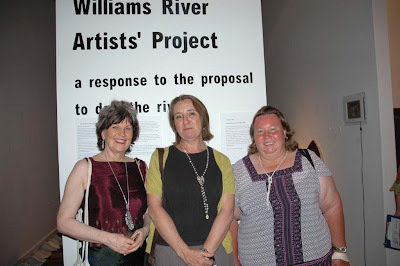 WRVAP organiser, Juliet Fowler Smith (centre) with Sally Corbett of the No Tillegra Dam group (left) and local resident/campaigner, Patricia Middlebrook (right) at the opening of the Williams River Artists Project show at Muswellbrook Regional Gallery, October 24, 2009. Project organiser, Juliet Fowler Smith reports: The opening of the WRVAP exhibition at the Muswellbrook Regional Arts Centre was packed thanks to being on with the Muswellbrook Art Prize- the Mayor opened it and I got to say a few words too. A group from Dungog came which was great and we were able to get some signatures on postcards about the EAR submission re the dam, which the Wilderness Society is co-ordinating. We also got front page coverage in the Muswellbrook Chronicle and were interviewed by ABC local radio plus other coverage in local media. 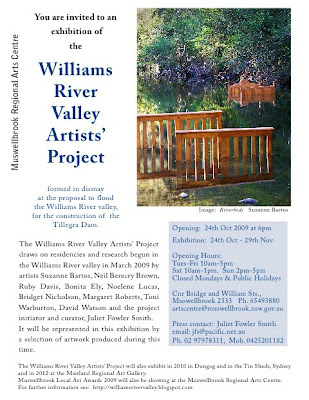 The show contains Noelene’s video of the river flow, my couch with water filled cushions, Bridget’s feet/shoes, Marg's No Williams River Collection on a digital photo frame, David’s beautiful image River Mourn and Suzanne's bedhead/surfboards. 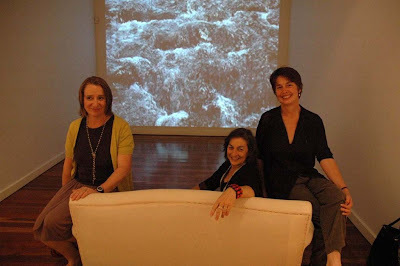 WRVAP artists (left to right), Juliet Fowler Smith, Noelene Lucas and Suzanne Bartos, on Juliet's Water Couch (with water-filled cushions) in front of Noelene's video The Last Healthy River in the Hunter, at the opening of the Williams River Artists Project show at Muswellbrook Regional Gallery, October 24, 2009. 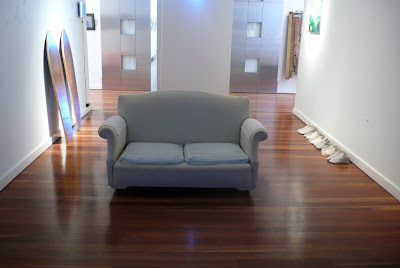 From the Williams River Artists' Project show at Muswellbrook Regional Gallery: L to R: R.I.P.- no chance, bed-head surfboards by Suzanne Bartos, Take Us Instead (and leave the water in the river) slide-show in wall photoframe by Margaret Roberts, Water Couch by Juliet Fowler Smith, River Mourn, photographic print by David Watson, and Touch this earth lightly, feet-work by Bridget Nicholson.